The shock wore off slowly. We’re actually going to take a year off! It sounds a bit crazy. There are plenty of more sensible things we could spend our money on. We started budgeting and saving our coin. Now it’s time for some of the fun planning stuff. 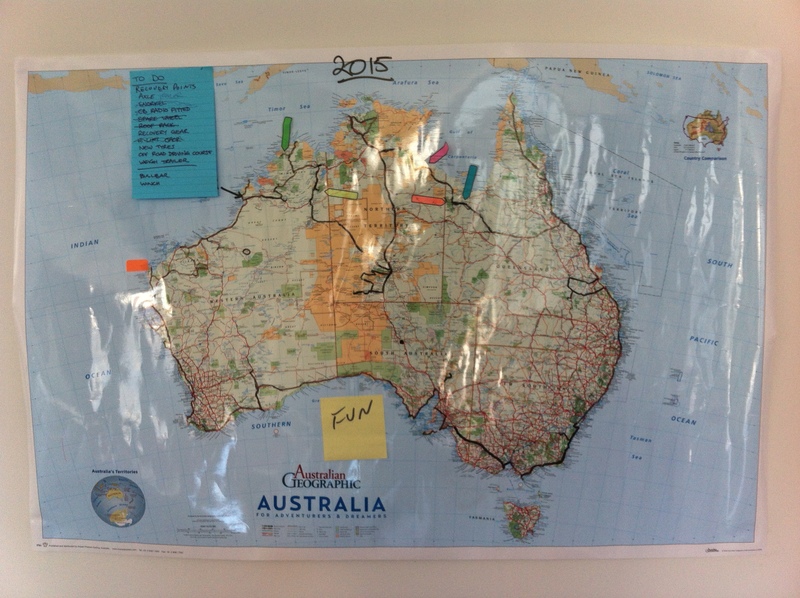 Ems went to the National Geographic shop and bought a laminated map of Australia and tacked it on the wall in the living room. Whenever we saw something that looked good on the interweb, TV show or magazine we’d use a whiteboard pen to mark it on the map. Slowly we started connecting the dots, planning our route around the country. Looking at time frames, weather and events to work out the best time of year to be in each location. Uh Oh! Timetable clashes. We can’t be in multiple places at once – we have to choose which stuff to do and which to miss out on. We both REALLY want to see the Kimberly and top end. This means we have to be in the northern part of the country during their dry season (May to Sept). If we run out of money and have to skip a bit – we’ll skip the east coast as spent 8 weeks travelling this part of Oz in 2001. Once we’d agreed on those two things, it was quite straight forward that we would leave Melbourne and head west, lapping the country in a clockwise direction, leaving the east coast to the end. This will mean we’ll miss seeing the whales off the great southern bight, but hopefully we’ll catch them further north, either along the east or west coast. We’ll also miss seeing the wildflower blooms in WA as we’ll be there at the wrong time, but we should be in Queensland at the right time see the turtles laying their eggs and will be the in the desert centre in the cooler winter months. Initially we planned to leave around October and spend some time exploring Victoria on our way across to South Australia. We considered three routes to get there. Along the top – Following the Murray river’s course through towns like Echuca, Swan Hill and Mildura appeals to us. This would also be a cheap option as we could free camp a lot. Along the bottom – Along the world famous Great Ocean Road. We used to head down and visit Apollo Bay and the 12 Apostles on a regular basis. We hadn’t made up our mind which way we would go, when due to work commitments and a few other reasons we decided to postpone our departure until Christmas. We could probably still take any of the abovementioned routes, but it will be the the start of the summer school holidays, so all these places will be in peak tourist season. Worried that we’d turn up in a busy area and not be able to find space to put the camper up, we’ve decided to book our campsites for most of January. Not wanting to spend top dollar on places we’ve seen before, we’re going to high tail it out of Victoria and head straight to South Australia on day one. Booking campsites for a whole month will no doubt blow our budget, so we’ll be seeking out free camp sites later to make up for it. Well that’s the plan and to quote Woody Allen “If you want to make god laugh, tell him your plan”. Next Post Should We Travel With Our Dog?